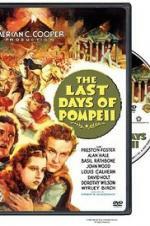 Buy or Rent The Last Days of Pompeii (1935) Movie DVD & BluRay Online! Movie Plot: Peaceloving blacksmith Marcus refuses lucrative offers to fight in the arena…until his wife dies for lack of medical care. His life as a gladiator coarsens him, and shady enterprises make him the richest man in Pompeii, while his son Flavius (who met Jesus on a brief visit to Judaea) is as gentle as Marcus once was. The final disaster of Marcus and Flavius’s cross purposes is interrupted by the eruption of Vesuvius.